Tiles gradually covered with a layer of plaque from water, grease, or detergent, e.g. soap. Especially often this problem occurs in bathrooms or in the kitchen near the plate, and on the floor too. To clean the tiles and return it to the original brightness, but you need to put in a little effort and spend a lot of time. Regular maintenance of tile makes cleaning quick and easy, it is not necessary to scrub stubborn dirt old. Dirty launder in the usual dishwashing detergent. Lightly dampen the tile, RUB with a sponge and allow to soak for a few minutes, but make sure that the water does not evaporate completely, otherwise you'll have to repeat everything from the beginning. Then RUB the active tile in a circular motion and rinse it with clean water. Don't forget to wipe dry with a towel to avoid drips from the water. If the dirt is not washed away, use a stronger means. For example, buy a cleaning gel for tile. It contains abrasive particles and removes even the most stubborn dirt. But do not overdo it or you may damage the smooth surface of the tile and dirty he starts two times faster. When the tile is very dirty, and to go to the store there is no way you can use the usual baking soda. Apply a small amount of baking soda on a damp sponge and RUB the tiles. But as this can damage the surface, so keep a sponge and the wall was wet, under the influence of soda softens the water and stops to scratch the surface of the tile. Can also use chlorine. Dilute bleach with water and spray spray tile. Wait a bit and wipe with a damp cloth. This cleaning method is able to cope even with the mold, which often appears in the bathroom. If you do not want to contact with chlorine buy in the store liquids for cleaning tile. Such tools do an excellent job with all types of dirt that can appear on the tile in the bathroom and the kitchen. 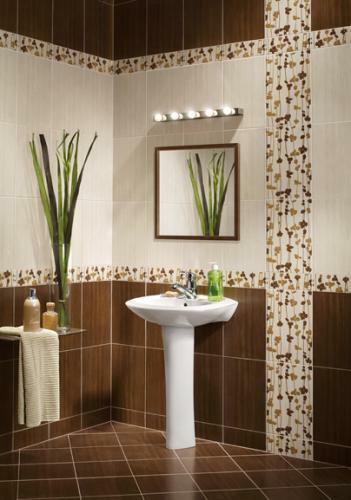 For regular maintenance use tile product for cleaning glass and mirrors. Not only does it cope with weak pollution, but will also add Shine to tile. Orosite surface of the tile means, wait and wipe with a soft cloth. Processing is preferably carried out two times a week.